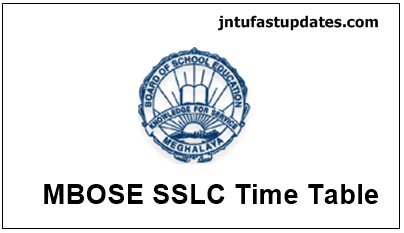 MBOSE SSLC Routine 2019: Meghalaya Board of Secondary Education (MBOSE) has released the MBOSE SSLC Time Table/Date Sheet 2019 at www.mbose.in. All the students undergoing Meghalaya Board 10th Class in Meghalaya schools will have to check the Exam dates and Download the Routine PDF. Meghalaya Board 10th Class Date Sheet: The MBOSE has announced the Meghalaya SSLC exam routine, exam dates, and timings in local news portals and newspapers. As per the Routine, Examinations will be held from 5th March, 2019 to 18th March, 2019. The Board is going to update the Meghalaya class 10th date sheet March 2019 examinations on its official portal, mbose.in. Keep checking the MBOSE Official website to know the latest updates from the Meghalaya Board. Check more information from the following article. by Regular Candidates of both Affiliated and Unaffiliated Schools, Improvement Candidates and Private Candidates for the forthcoming Secondary School Leaving Certificate Examination-2019 to be held during the month of March. Meghalaya Board of School Education is shortly known as MBOSE. This is the state level educational board offers quality education in the state of Meghalaya. The board was established under Meghalaya Board of School Education Act in 1973. MBOSE is functioning for development of quality education for secondary and higher secondary classes in the state. Students undergoing their education under MBOSE can check the updates regarding time tables, results, admit cards, and other important notifications from the MBOSE official website, mbose.in. Every year a huge number of students gaining their certification from this board. The Meghalaya Board annually conducts the SSLC and HSC examinations in March/April months and releases the results in May month. SSLC (Secondary School Leaving Certificate) Examinations will take place in the month of March. Last year the Meghalaya Board has conducted the SSLC examinations from 2nd March to 16th March. This year also the examinations will be likely to conduct approximately same as last year. The MBOSE has announced the Meghalaya SSLC Date Sheet 2019 in the month of December. Also, the board announces the admit card download dates along with exam dates. Students appearing for 10th class examinations in Meghalaya state can get ready for the board examinations by preparing the subjects well. Stay visiting the MBOSE Official website, mbose.in to check the time table and exam dates. 1. The Examination halls will be opened at 9:30 A.M. in the morning. 2. Question Papers will be distributed to all the candidates at 9:45 A.M.
3. Answer Scripts will be distributed at 9:50 A.M.
4. Candidates will start writing at 10:00 A.M.
5. In the event of important announcement from the State/Central Government on dates coinciding with the programme, rescheduling of the Examination programme if deemed necessary will be done. Note – A: Indian Languages : Khasi, Garo, Assamese, Bengali, Hindi, Nepali, Urdu and Mizo. Note – B: Vocational Subjects: Tourism, Health Care, IT/ITES, Electronics, Agriculture, Beauty & Wellness. On the homepage, MBOSE SSLC Exam Routine 2019 Link appears; Click on the Link. Students can check the date sheet in PDF format. Save it and take a printout of it. Thank u for the routine, now I just have to prepare for it.